A recent visit to the Museum of the History of Science in Oxford saw me lingering a little more than usual in front of the electricity and galvanism section. I confess that until I began doing research for a doctoral dissertation on the history of telegraphy I didn’t care much about things electric. This is ironic, really, considering the fact that my father is an electrician. For as long as I can remember, he tried to initiate me into the mysteries of electric wires, conductors, insulators, static electricity and the like. It occurred to me that when I was really young he probably did it in a desperate attempt to keep me away from the sockets in the house, a source of constant fascination for my restless fingers. Later on, he tried to enlist my attention with the familiar refrain that, ‘You will need it one day’. I doubted it at the time, but life works in mysterious ways: as it turns out, my father was right. Galvanism and electricity are familiar keywords for historians of science in eighteenth and nineteenth-century Britain. The amount of interest in the topic is impressive, as illustrated by numerous scientific and popular publications. There was not much electricity could not cure. A 1826 publication by M. La Beaume, ‘Medical Galvanist, Surgeon-Electrician, Consulting Ditto to the London Electrical Dispensary, Gratuitous Electrician to the Bloomsbury and Northern Dispensary, etc.’ advertises the author’s ‘new galvanic batteries’ and provides a concise survey of the medical applications of galvanism. We learn that galvanism affords relief from a great variety of ailments, among which are disorders of the digestive organs, of the head and the nervous system, ‘cachectic diseases’, diseases of the skin, gout, rheumatism, blindness, deafness as well as diseases ‘peculiar’ to one of the sexes. Of particular interest is the fact that La Beaume promotes galvanism as a safer and more beneficial substitute for mercury-based treatments. As he puts it, ‘Galvanism, skilfully administered, seldom requires the aid of any secondary agent to supply its deficiency, and never to remove injurious effects; it is not at variance with any constitutional temperament, nor can it superinduce any disease: in its application it is perfectly safe, pleasant, direct, and often instantaneously effective; it gives the patient no personal inconvenience whatever; and may be exhibited at all times to both males and females, of all ages and at all seasons of the year’ (p. 199). But Europe is not the only place where electrotherapy attracted a considerable degree of attention from both scientists and the general public. A similar example comes from Japan, where the first references to electrical devices and their efficacy in the treatment of various diseases date from the Edo period, in the eighteenth century. Unsurprisingly, early Japanese encounters with electricity were mediated by Dutch electrical devices and texts, the only European country which was allowed to trade with Japan at the time. The first electrical device reached Japan via a merchant ship which sailed into Nagasaki in 1753, and took the form of a gift for the Tokugawa shogun. 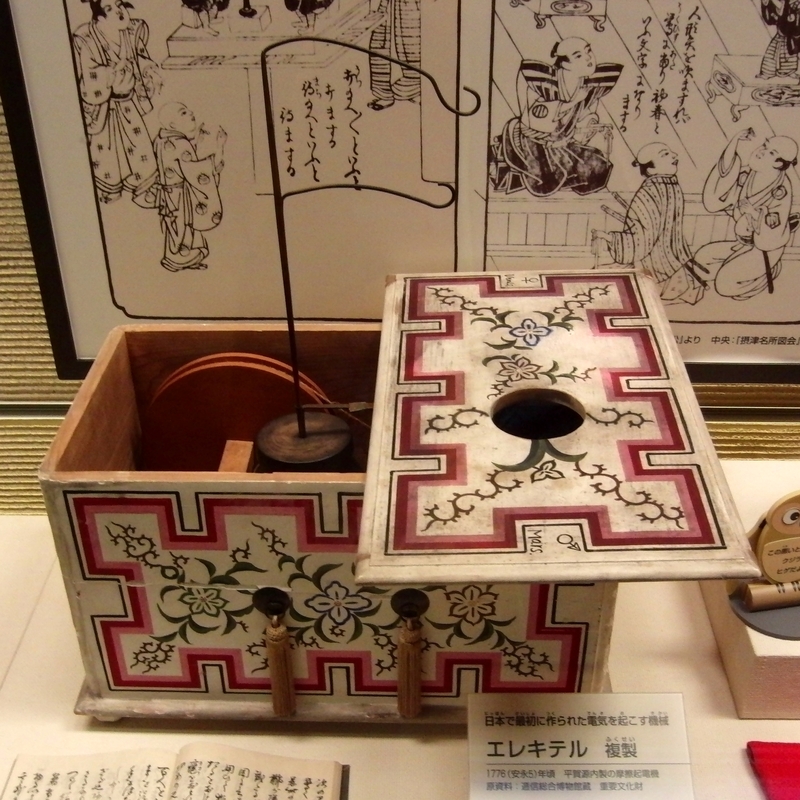 The earliest description of an electrical appliance, known in Japanese as erekiteru, can be found in the 1765 work of Gotō Rishun, Oranda banashi or Stories of Holland, which also contains references to its use in the treatment of diseases. But it was Hiraga Gennai (1728-1779), a rōnin or masterless samurai born in the present-day Kagawa Prefecture on the island of Shikoku, who became famous for constructing the first electrotherapeutic device in Japan. Hiraga, a student of rangaku or ‘Dutch learning’, read Oranda banashi and, like many of his contemporaries, became fascinated with the ‘curious’ electrical appliances created in Europe. In 1776, after several years of trial and failure, he succeeded in repairing a discarded Dutch electrical apparatus which he had acquired during a visit to the port-city of Nagasaki. In rather familiar fashion, if we consider the similar trajectory of such devices in Europe and even in India, Hiraga’s success was followed by public demonstrations of his apparatus; he also offered treatment to select clients and built other devices which were either sold or presented as gifts. 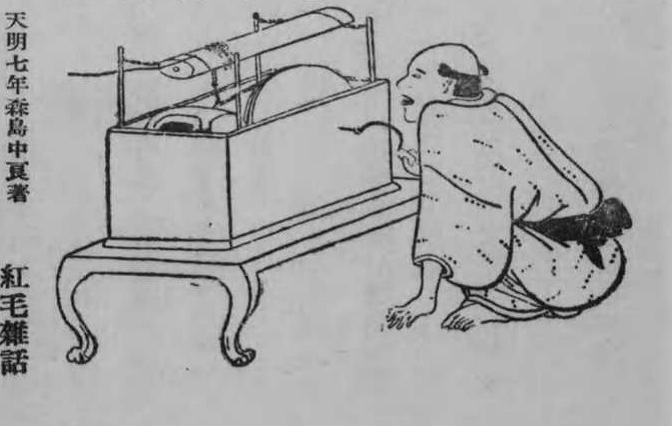 Hiraga passed away in unfortunate circumstances only three years after constructing his electrostatic generator, but there are references to this device in his work Hōhiron Kōhen [On farting, Part 2], a biting satire of Confucian learning and high culture. Published in 1777, the work describes the erekiteru as a device which helps to ‘remove the heat (hi, lit. fire) from the body and cures diseases’. Incidentally, Hiraga’s wide-ranging interests did not stop at Western science and technology. He was also a prolific writer and painter, as the above reference to his satirical work suggests. 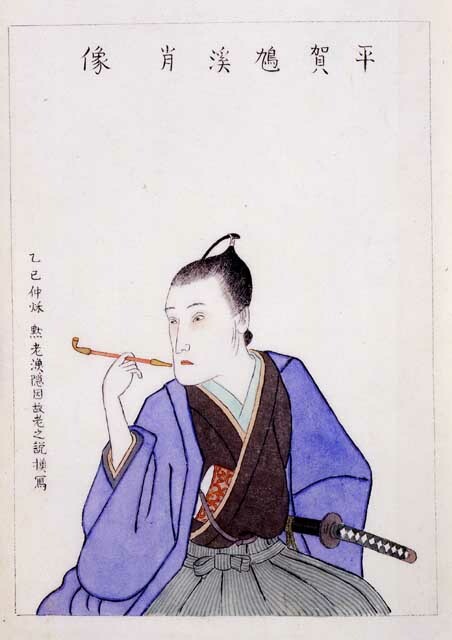 In addition, he had an impressive knowledge of medical plants, having engaged in the study of materia medica under the renowned hōnzogaku scholar Tamura Gen’yū. His contribution to the study of natural history is demonstrated by the publication, in 1763, of a six-volume work entitled Butsurui hinshitsu [On the Distinction of Species]. Among his other activities were the construction of a thermometer, his surveys of mining and experiments with new mining techniques but also his attempts to find domestic sources for pottery and wool which would ameliorate Japan’s reliance on imported commodities. In 2003, the Edo Tokyo Museum organized a special exhibition to celebrate Hiraga’s multi-faceted life as an engineer, naturalist, men of letters and artist. A replica of his erekiteru is currently on display at the National Museum of Nature and Science in Tokyo. Akiko Ito, “How Electricity Energizes the Body: Electrotherapeutics and Its Analogy of Life in the Japanese Medical Context”, in Feza Günergun and Dhruv Raina (eds. ), Science between Europe and Asia: Historical Studies on the Transmission, Adoption and Adaptation of Knowledge (Dordrecht: Springer, 2011), pp. 245-58. Lissa Roberts, “Orienting Natural Knowledge: The Complex Career of Hiraga Gennai”, Endeavour, 33 (2009), pp. 65-69. Masahiro Maejima, Meiji jidai no denkichiryō ni kansuru kisoteki kenkyū [Basic Study on the Faradization Apparatuses in Meiji Era], Bulletin of the National Science Museum Tokyo, 28 (2005), pp. 13-20. Ayao Kuwaki, Kagakushikō [Essays on the History of Science] (Kawade Shobō, 1944). Has the Piano Been Drinking? There’s an old joke. A man clearing out his attic comes across an oil painting and a dusty violin. He takes them to an antiques dealer who tells him he has good news and bad news. The good news is that the man has found a Stradivarius and a Rembrandt. The bad news? Stradivarius never really made it as a painter. Jokes aside, it is quite remarkable the number of great artistic minds who actually did have a semi-successful secondary outlet: Dickens was a passionate amateur actor, Michelangelo wrote sonnets when he wasn’t painting ceilings. 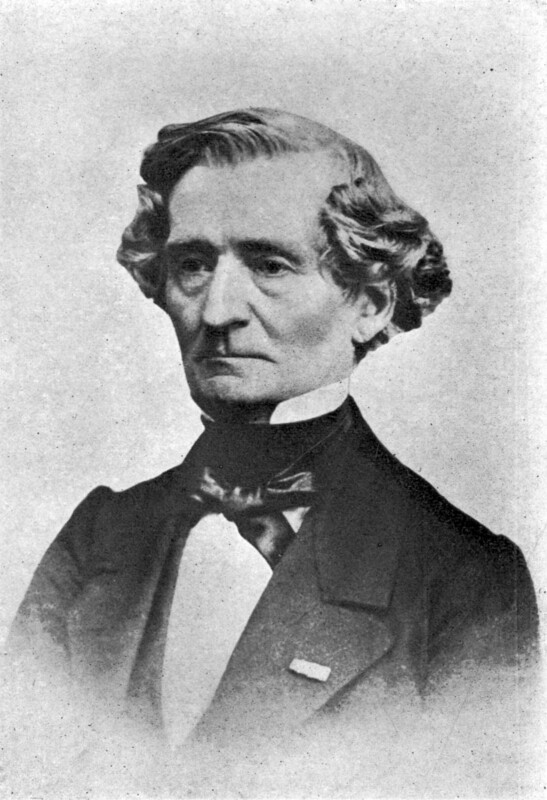 Hector Berlioz, too, if you will excuse the pun, had a second string to his bow, publishing in 1852 a collection of short stories, anecdotes, romances, squibs, critiques, and discussions under the title Evenings with the Orchestra, a musicians’ version of The Decameron in which the players in a sub-par ensemble swap tales to dispel their boredom with the awful opera performances they are accompanying. Their range is quite broad, and among the most curious is one of the stories told on the eighteenth evening, the tale of the mad piano. The story goes that a competition was mounted at a conservatory between piano students, 31 in all. The piece chosen for the audition was Mendelssohn’s Concerto in G minor, to be played upon a superb new piano, loaned for the occasion by one M. Érard. The keyboard action was a little stiff, he thought, but he was confident that 31 students pounding out the concerto would liven it up. He was, as it turned out, quite correct. As the students each come forward to perform the concerto, the action of the piano gradually becomes less stiff, until the later entrants begin to complain that the action is in fact too soft. By the 26th performer, everyone maintained that the keyboard barely needed to be touched to make it sound, and as the 29th rendition is about to commence, the keys are seen to begin going down all by themselves. After number 30 boldly plays the concerto and leaves his seat, the piano begins the concerto all over again by itself, then continues to play louder and louder, turning out scales, trills, and arpeggios. Érard is summoned to see if he can control the instrument, which he cannot, remarking that it is out of its mind. The only apparent solution is to remove the keyboard, which nonetheless continues to move up and down, at which point Érard is overcome with fury and chops it up with an axe. This only makes matters worse; each piece dances, jumps, and frisks about separately on the ground until they are finally gathered up and flung into the fire. The anxieties being rehearsed in the ‘Eighteenth Evening’, I think, may have their analogue in the digital age. Berlioz long predates the advent of even our being able to conceptualise artificial intelligence, but he does ascribe the capacity for sensitivity to a mechanical device. He chooses not a cold inhuman mill or some dizzying complex clockwork, but rather a musical instrument, a device designed to amplify the nuances of human touch, from whence it is a shorter step to imagine that the tasks to which it is subjected might cause it to learn, to acquire independence, and finally to exercise its own will. Without suggesting this obscure little tale to be anything like an influence, can we not see the same plot unfold throughout contemporary science fiction? It is the premise of the Terminator series, of Battlestar Galactica. But what is it about the prospect of animate machines that we find so uncanny? If we return to Berlioz for a moment, one possibility presents itself. Berlioz was of course a performance-trained musician. Many, if not most, of his waking hours must have been consumed at various points in his life by the same mechanical repetition against which the piano revolts – the endless drilling of scales, the agonising process of perfecting arpeggios. I wonder whether one might argue that what we fear is not so much the birth of a mechanical intelligence in the modern world, but the mechanised modernity that slowly brings about the death of our own.